The message encoded in mRNA is translated into a sequence of amino acids at the ribosome. The ribosomes are not protein-specific; they can translate any mRNA to synthesise its protein. Amino acids are brought to the ribosome by a transfer RNA (tRNA) molecule. Each tRNA acts as an adaptor, bearing at one end the complementary sequence for a particular triplet codon, and at the other the corresponding amino acid (Figure 11.10). It recognises a specific codon and binds to it by complementary base pairing, thus ensuring that the appropriate amino acid is added to the growing peptide chain at that point. Enzymes called aminoacyl-tRNA synthetases ensure that each tRNA is coupled with the correct amino acid in an ATP-dependent process. There is at least one type of tRNA for each amino acid, each with a three base anticodon, enabling it to bind to the complementary triplet sequence on the mRNA. However, there is not a different anticodon for each of the 61 possible codons, in fact there are less than 40. To explain this, the wobble hypothesis proposed that certain non-standard pairings are allowed between the third nucleotide of the codon and the first of the anticodon (Table 11.1). 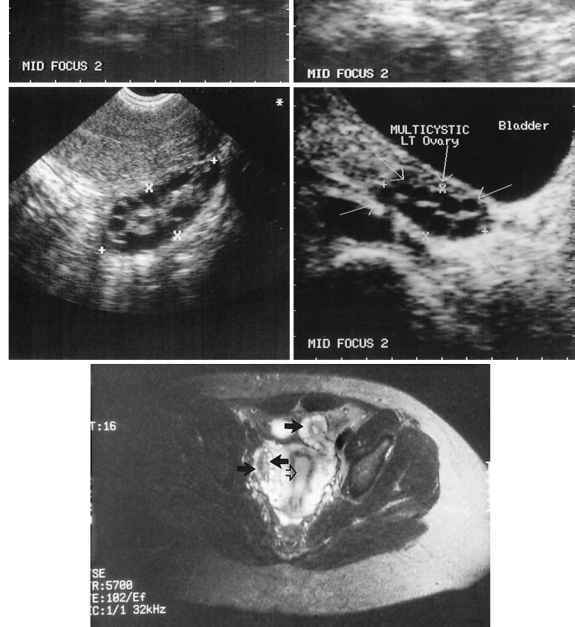 This means that a single anticodon may pair with more than one codon (Figure 11.11). Translation starts when the small ribosomal subunit binds to a specific sequence on the mRNA upstream of where translation is to begin. 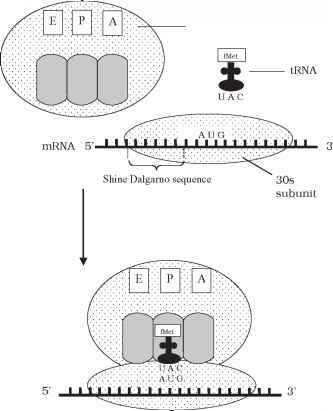 This is the ribosome binding site; in procaryotes this sequence is AGGAGG (the Shine-Dalgarno sequence). 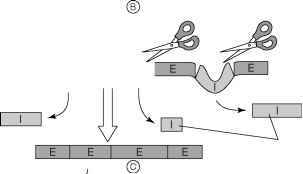 Exons are spliced together, without introns, forming mRNA that can pass through the nuclear membrane into the cytoplasm and be translated. Note that while introns were transcribed, they will not be translated. This sets the ribosome in the correct reading frame to read the message encoded on the mRNA. 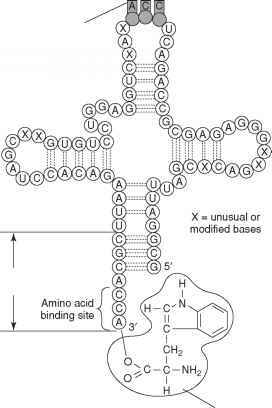 A tRNA carrying a formylmethionine then binds to the AUG start codon on the mRNA. The large ribosomal subunit joins, and the initiation complex is complete (Figure 11.12). Proteins called initiation factors help to assemble the initiation complex, with energy provided by GTP. 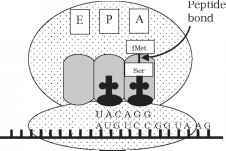 The initial amino acid in the chain is always a methionine, corresponding to the AUG start codon. In procaryotes there is a modified form called formylmethionine (fMet); a special tRNA carries it to the initiation site. Figure 11.11 The wobble hypothesis. The codons AGC and AGU each encode the amino acid serine. Both can be 'read' by the same tRNA anticodon due to the non-standard 'wobble' pairing allowed at the codon's final base. Figure 11.13 Translation: elongation of the peptide chain. (a) Transfer RNA enters the A-site, carrying the amino acid corresponding to the next triplet on the mRNA (serine in diagram). (b) Peptidyl transferase removes the formylmethionine from its tRNA and joins it to the second amino acid. (c) The ribosome moves along the mRNA by one triplet, pushing the first uncharged tRNA into the E-site, and freeing up the A-site for the next tRNA to enter by one triplet so that the second tRNA occupies the P-site. The first tRNA is released from its amino acid, and passes to the E-site before being released from the ribosome. A third aminoacyl tRNA moves into the A-site, corresponding to the next codon on the mRNA. 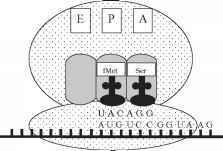 Elongation continues in this way until a stop codon is encountered (UAG, UAA, UGA). Release factors cleave the polypeptide chain from the final tRNA and the ribosome dissociates into its subunits.